Jon loves seafood and I really want to like it, so on Sunday I picked up trout at the market. As I've mentioned before, I don't like the overall seafood flavor that seems to be in every salt water fish I have tried. I don't mind catfish (farm raised), so I thought I'd try trout, another fresh water fish. 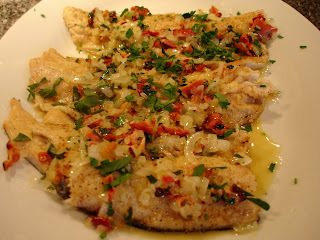 I found a recipe for Pan-Fried Trout with Bacon on my favorite web site for recipes - Epicurious. I made a few small changes noted below. Cook bacon in large skillet over medium heat until crisp, about 8 minutes. Transfer to paper towels to drain. Crumble bacon. Add 1 tablespoon butter and stir to melt. Sprinkle fish with salt and pepper. Coat flesh side of fish with flour; shake off excess. Add fish, flesh side down, to skillet. Cook 2 minutes. Turn fish over. Cook until just opaque in center, about 2 minutes. Transfer fish to 2 plates. Sprinkle fish with 2 tablespoons green onions. (I didn't want raw onions on the fish, so I topped it with the sauce and finished it with a sprinkling of fresh parsley). This sauce was very good on the fish. I was hesitant about the bacon with the fish, but it worked. And I am so, so glad we both tasted the tarragon before I started cooking. It tasted like anise, a flavor we both don't care for at all. My only complaint was that the market didn't do a very good job of cleaning the fish. Trout is a very bony fish to begin with, but we shouldn't have had to pick out this many bones. 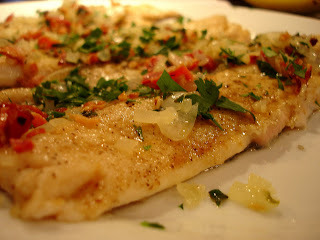 I'd make this dish again, but maybe with something like flounder. 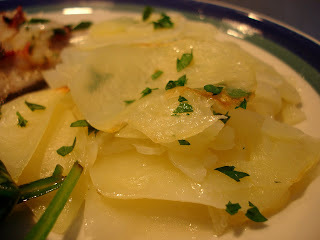 Fish needs light sides, in my opinion, so I decided on this recipe for Lyonnaise Potatoes, and also made Sauteed Spinach. 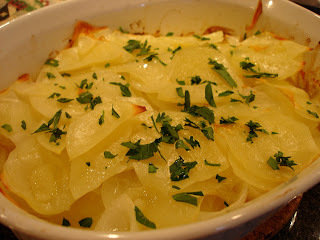 Potatoes are normally a heavy dish, but I sliced them very thin and ended up with a perfect, light potato casserole. And I added my favorite secret ingredient...truffle oil. White this time. Lightly coat a small baking pan with olive oil. Layer potatoes and onion in pan. Season with salt and pepper. I then poured some white truffle oil over the top. Lightly spray or brush with olive oil and return to oven, uncovered, 10 more minutes to lightly brown potatoes. I simply broiled them for the last 5 minutes instead of adding more oil - worked perfectly. Once done, I sprinkled them with some fresh parsley. I love how light these potatoes tasted!! Thinly slicing them worked perfectly for this dish. The addition of the white truffle oil was a good call - how can you go wrong with the flavor of truffles? It was also very easy and is something I will make again. My sauteed spinach is pretty standard - olive oil, spinach, and some kosher salt over medium high heat for about 2 minutes. Have a delicious week everyone! yum! I love fish and that sounds delish! And those potatoes ... gorgeous! Those potatoes look great! They look very classy sliced that thin... kind of dresses them up. ok i never heard of truffle oil!!! i want to try this dish!